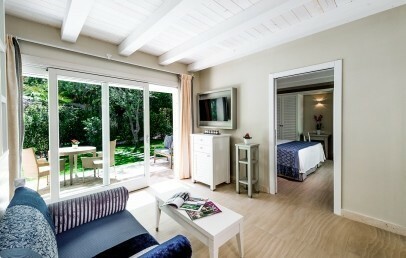 Located in a bay on the southwest coast of Sardinia, immersed in a luxuriant garden of mediterranean colours and scents, Forte Village Resort is a paradise for adults as for babies, a place where to spend unique and unforgettable holidays, which will amaze also the most experienced travellers. It is only 45 km far from Cagliari, the most important city in Sardinia that offers different day and night attractions. Among the hotels in the Resort is the Hotel Bouganville, a 4* of great quality, where to spend some rare moments of tranquillity without being stressed from the rhythm of the everyday life but only concentrated on the recovery of their spiritual well-being. What attracts the attention of the observer is the particular position enjoyed from the Bouganville Hotel. Located in the middle of a tropical garden between very high palm trees, flowers of various species and surrounded by a luxuriant garden. Located near the swimming pool Oasis, it enjoys a very strategic position. It is perfect for families with children, because it has wide rooms where they can be accommodated in a very comfortable way. Forte Village offers for children of all ages the services mostly requested by parents, as an equipped mini club with a specialized staff, 2 swimming pools, sport activities for all tastes, day and night shows studied just to make children have fun. 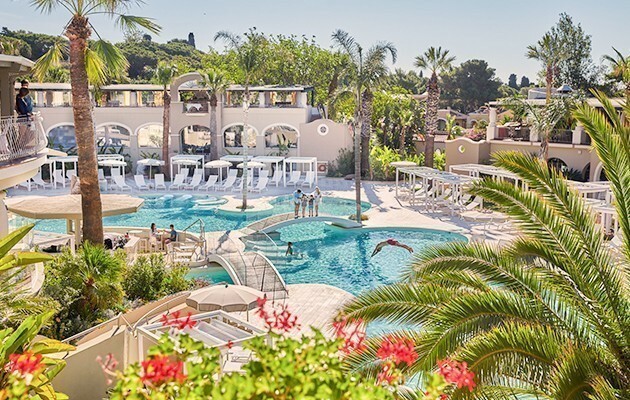 At the Hotel Bouganville is guaranteed the relax for the parents, big fun for children, thanks to the its philosophy, to satisfy any needs of all members of the families. Deluxe Bungalow – Spacious double bedroom with sofa bed upon request. Bathroom with separate shower and tub. Private patio and garden area. Ideal for 2 adults and 1 child. Deluxe Family Bungalow – Two rooms separate by a sliding door, double bedroom, bathroom, living room with a sofa bed that opens up into two beds. This accommodation is recommended to families composed by two adults and two children under 13 years of age. Deluxe Family Plus Bungalow – Two adjoining bedrooms with a connecting door, one room has twin beds or a double bed, an extra bed can be added on request. 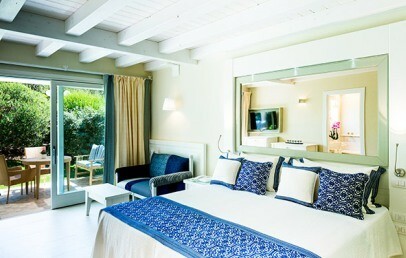 The second room has 2 single beds ‘L’ shaped. 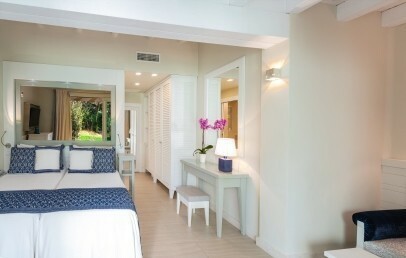 Each bedroom has its own bathroom, a separate patio and a separate entrance. Ideal for families of 5 people with children under 13 years. Luxury Family Bungalow – Spacious and modern Bungalow with two rooms separated by a sliding door, double bedroom, bathroom with tub and shower, living room with a sofa bed that opens up into two beds. This accommodation is recommended to families composed by two adults and two or three children under 13 years. Forte Village Resort offers a wellness centre and Spa, that is considered the most famous Thalassotherapy centre of Sardinia: the Acquaforte Thalasso Spa. Dipped in a wonderful garden of various colours and particular for its mediterranean scents, this centre guarantees to its guests an unforgettable experience of delight and relax. It offers treatments with marine elements (water, sand, algae), 6 pools of marine water with different temperatures, different types of massages, herb teas for all tastes and uses. Further restaurants open for dinner, available with a supplement (table reservation required): Belvedere, Cavalieri, Le Dune, Forte Gourmet, Terrazza San Domenico, Hell’s Kitchen. For lunch guests can choose among a quick snack at the bars or try following restaurants as the Oasis Pool (delicious lunch menus with hamburgers, sandwiches, sushi, salads) or the dedicated restaurants (including Pizzeria, Pasta House, Beachcomber e Fishmarket). It can be practiced various sport activities as there are: 12 tennis courts all with artificial lighting, 3 football fields with stands and a regular grass field, 1 modern full equipped gym, various water sports, scuba diving and a 18-holes Golf Club, Is Molas Golf Club, at 8 km away. It also has 10 swimming pools, 2 of them are for children, located in different sides of the resort area. For the shopping lovers the Resort offers a variety of boutiques where are to find all the prestigious griffes of the Italian fashion. These are all concentrated in the promenade alongside the Piazza Maria Luigia, where you can also find the chauffeur, the kiosk and the jewellery. In the evening the square becomes a meeting place, where take place different entertainments that fit for adults as for children. Tourist tax – The municipality of Pula requires the payment of a tourist tax of € 1,50 per person/night to be paid on spot. The tax applies from 01.04. to 31.10. Children under 12 years, disabled people and their assistants, business travellers and students are exempted. Large double bedroom with new elegant decor; sofa bed upon request. 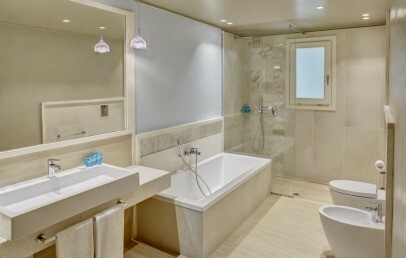 Bathroom with separate shower and tub. It provides private patio and garden area. Ideal for 2 adults and 1 child. Spacious accommodation with wew elegant decor. 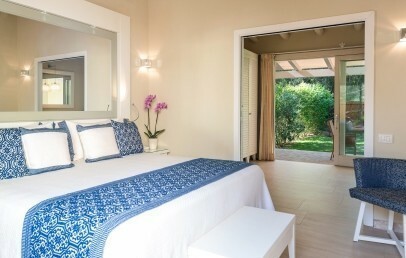 It consists of two adjoining bedrooms with a connecting door; one room has twin beds or a double bed, an extra bed can be added on request. 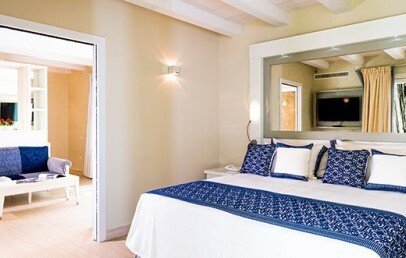 The second room has 2 single beds ‘L’ shaped. 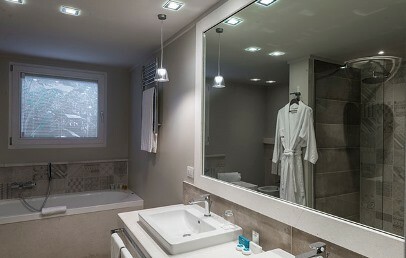 Each bedroom has its own bathroom:one has bath tub and shower the other a shower. Separate patio and separate entrance. Ideal for families of 4 or 5 people with children under 13 years. 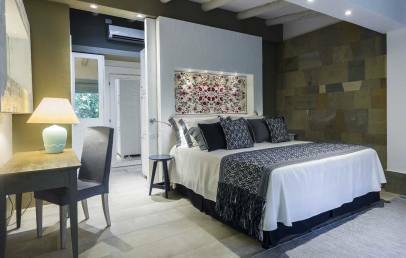 Boungalow of two separate rooms, the master bedroom and the living room with a sofa bed, that opens out into two beds for children up to 12 years. The bathroom has a tub, a shower and hair dryer. It offers a private patio area. 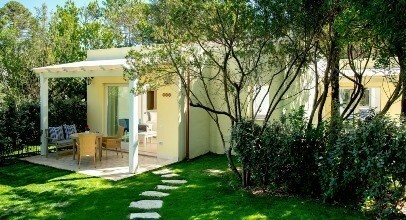 It is an ideal accommodation for two adults and two children under 13 years. 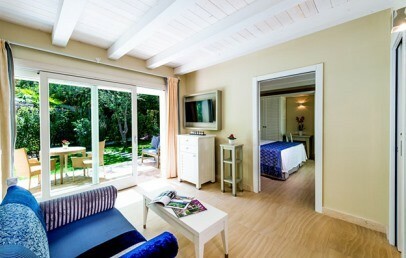 A fully refurbished Bungalow offers two rooms separated by a sliding door. The master bedroom with Kingsize bed and bathroom with tub and shower. The living room with a sofa bed, convertible into tow beds or on request, it can be replaced by two single beds. A cozy outdoor area with private patio embedded in the perfumed garden. This accommodation is ideal for a family of 2 adults and 2 or 3 children under the age of 13 years. 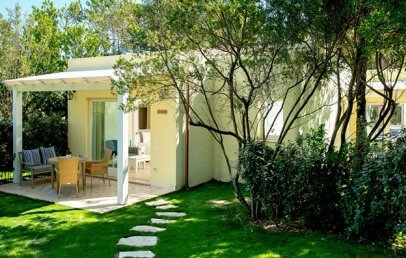 The modern Deluxe Family Play Garden Bungalow is composed of two separate rooms. The master bedroom with bathroom with tub and shower and the living room with a double sofa bed convertible into two beds for children. 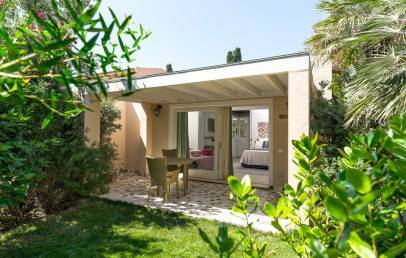 The bungalow offers a private garden equipped with children's toys a placed in a quiet corner of the Resort and is ideal for families with small children. Some rooms have the outside area surrounded by a wooden fence.